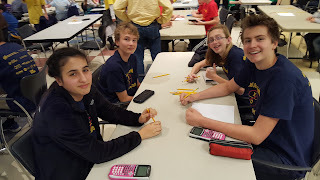 We are very proud of our four students who competed in the State MathCounts competition on Saturday in Carrboro, NC. WAAS was a school among 35 other public and non public middle schools who competed. It didn’t take any of us long to realize that we had stiff competition, but our students had a great showing. Congratulations to the entire MathCounts team, parents and Mr. Simon for your hard work in preparing for the two competitions and earning the right to compete on the state level! the North Carolina MathCounts Competition in Carrboro on March 5, 2016.
their Community Focus Project for the third nine weeks. Hang On! Spring Break is coming!! The dates for the ITBS are April 4-8. Students will test in the mornings of each day during the week. Reading, Vocabulary, Language, Math and Science will be included in the test. Since our students learn and practice these skills every day, the only preparation needed is a good night’s rest, a hearty breakfast and arrive to school on time. Thanks to Tammi Pitts and Mrs. Puritis, WAAS will be sponsoring a Scholastic Book Fair in the afternoons of April 4-8. Siblings and parents are invited. Good luck to our Science Olympiad Team this week end as they are competing in the Invitational Tournament in Charlotte, NC.